I wasted absolutely no time at all changing into my swimwear and heading straight to the beach. We were staying in Santa Monica and luckily only two blocks away from the iconic beach. This was the groups ‘free time’ before meeting the new members and CEO’s who were travelling the rest of the West Coast with us. Honestly I needed a day of just relaxing on the beach and taking in that fabulous Californian sunset. It was around 30c but at times I was shivering because I was so use to the heat and humidity of the East Coast (crazy, I know!). I saved my precious Oakley sunnies for this leg of the trip as they fitted in nicely with that beach vibe – long story short I lost them as soon as I entered the ocean! A nice big wave crashed into my face and within a second, they were gone. Ironically these were not the only pair I lost (RIP sunnies at Yosmite Waterfall) – I think I was cursed! Anywho once the sun set, Santa Monica Pier and Pacific Pier were next on the list. Wondering around this famous and fun place brought me back to my childhood and it looked magical lit up at night. The pier was buzzing with people and various attractions – the mini funfair was so cute and the food was even better.. by far one of my favourite days of the entire trip. Think U2 and their fifth studio album and that is Joshua Tree – the Southeastern California National Park is something out of a Western movie. Growing up my Daddy lived for his Cowboy films and it’s all I could think about when I first stepped foot on this magnificent piece of untouched land. I didn’t really take many photos here as I just wanted to stand back and admire the place – it honestly took my breath away. The heat was something else but the hike and views were worth it when we reached the top. Once we hopped onto our bus, we headed straight for our final destination of the day and pitched our tents for the night. You can see that we had thee most perfect backdrop for sleeping and needless to say we all jumped straight into the river with our Coronas in hand. A surprising sand and lightening storm came out of nowhere but I decided to stay in the river … smart move eh?! The mountain surroundings were a majestic view for watching the sunset … I could easily enjoy a week or two here each Summer! This was one that I was BEYOND excited for!!! I think this place has to be on everyone’s bucket list and I am so happy to say that I’ve now paid it a visit. As it’s one of the Seven Wonders of The Nature World, I’m on a mission to visit as many as I can! SOOOO.. our creative little CEO’s decided to surprise us with the ultimate reveal of the Canyon. We had brown paper bags placed our head and had to walk in straight line until we were told to take them off. Once we got the OK to remove them, we were standing at the very edge of the Grand Canyon (felt sorry for those with a fear of heights!) and I can’t even begin to put into words just how I felt at that moment. First of all it looked fake because seeing it on TV and in real life is two completely different experiences. I just stood silent as I was in shock at how amazing it was. I’ll without a doubt treasure that moment for as long as I live – if you can make the trip to this majestic place then do it! Ooooh I also forgot to mention the pizza party we had on the South Rim to watch the sun go down. I was absolutely starving after the hike down to the Windy Ridge and I had to ask one of the girls to take a snap of me enjoying it! Then there was the moment I braved my Vertigo (and wiggled my way) to get a snap of me living on the edge of the rim – although my girl (Emma) was behind me ready to pull me back haha that’s friendship! What can I say – Vegas is Vegas. It’s what you see on TV, it’s a crazy old town and full of surprises. I was a little delirious once we arrived as I had gotten sick and my body had hit a brick wall. After a slide ride through the Shark Tank in our hotel and a good old gossip with my Scottish spooning buddy Em, I was then ready to go. It felt so good and strange at the same time to get a shower in a room. We were use to showering in amongst the insects and air drying ourselves with the humidity (but I loved it regardless) but I felt like I was cheating on camping the few times we stayed in a hotel! Anyway, after watching the Fountains of Bellagio show (my very own Oceans Eleven moment) and a quick burger at Mark Whalburgs place, it was on to Hyde Club at the iconic and fabulous Bellagio Hotel. I’m not that into clubs but when you’re in Vegas anything goes and I have to admit I quite liked it. It overlooked the fountains and the funky little Eiffel Tower was our view for the night. We managed to stop at the Welcome to Las Vegas sign and the Little White Chapel … the rest is history! This day was a little blurry for driving as it was the morning after Vegas and I was a little worse for wear! 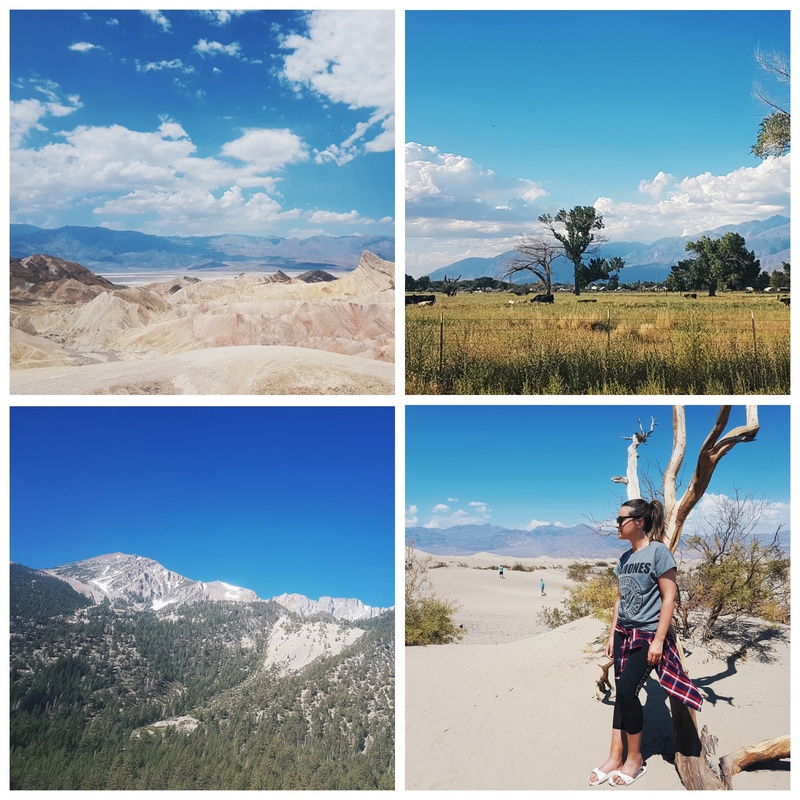 Of course on this particular day we were off to visit Death Valley – a desert that is registered as the hottest place on earth and 70 metres below sea level. I kid you not I thought I was going to pass out but I just kept telling myself to have an open mind (of all days to have a nasty hangover). I’ve never experienced heat like it but I managed to bury my face in a watermelon and only lifted my head to allow for air. There was a Naval base nearby which was pretty cool as the Fighter Jets were out practising – the noise and speed of those things is insane. Despite the heat and my hangover it was a truly incredible event to witness and one I’ll probably never get to experience for a while yet. Next we headed up and over the Serria Nevadas mountains for another fun adventure – the altitude was pretty intense hence why that day was such a surreal one for me. Those mountains have to be one of the most beautiful views known to man – the height was pretty fascinating as we were up just over a mighty 6,000 feet compared to 70m below sea level just an hour or so before! We were literally up and down that day but wouldn’t have had it any other way – not even our Vegas antics the previous night stopped us. Without a doubt the most beautiful place from our trip! This iconic Park is known to anyone who hopes to or has travelled around the States. 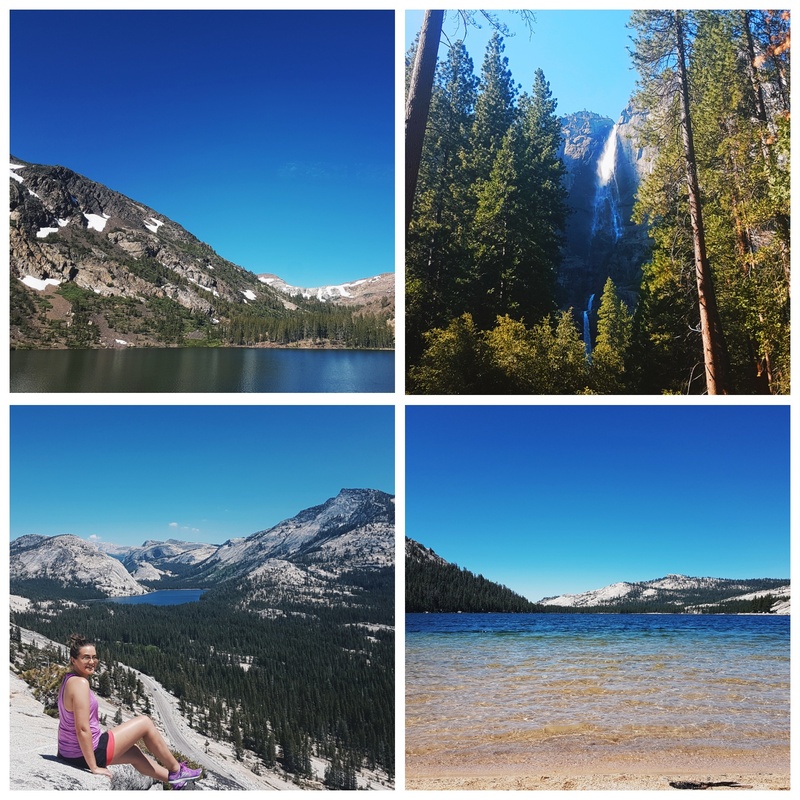 I was in my element when we reached Yosemite National Park – the views were only ever in my wildest dreams and anytime I’m surrounded by water, I’m immediately in my happy place. It’s such a scenic drive to take and the little pieces of snow left on the mountains made it a magical day. I thankfully brought my swimwear with me and indulged in a baltic swim in Tenaya Lake – a beautiful and crystal clear little lagoon nestled between the Yosemite Valley and Tuolumne Meadows. It’s crazy because the surface of Tenaya Lake has an elevation of 8,150 feet – again with the ups and downs! I have a fun slow-mo video of my splashing around in the lake over on my Instagram along with a few images of the park. After our fun in the water we hiked up Northwest of the lake on a mini trail for an overall view of the lake and pretty granite surroundings. A quick stop at the waterfall and yet another accident involving a second pair of sunnies and we were off to our final camp ground of the trip. A bitter sweet end to the adventure of a lifetime! 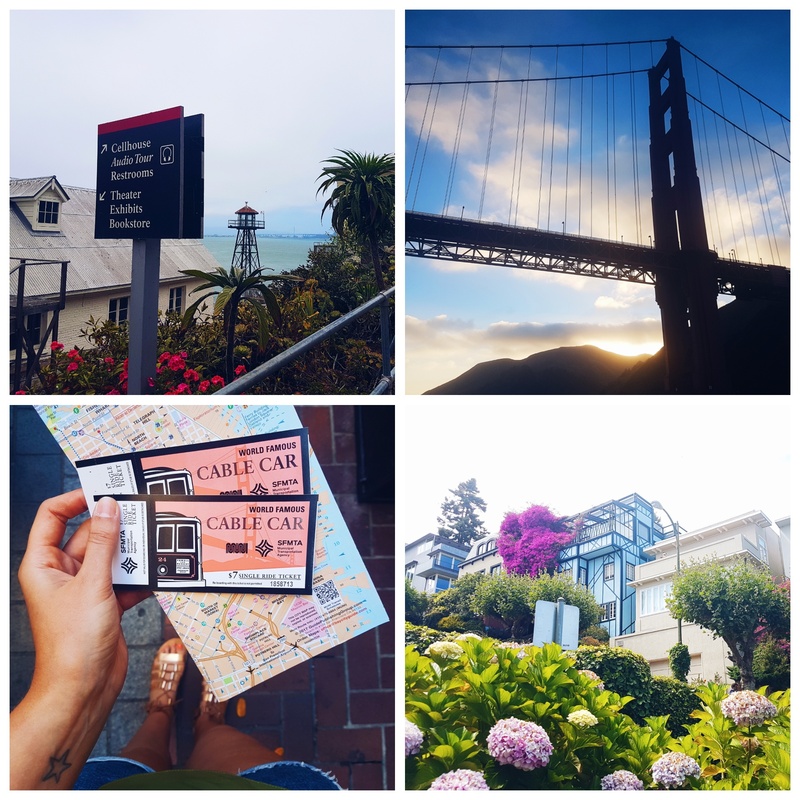 Truth be told I was both sad and happy to visit San Fran as my hugely hyped about roadtrip was fast coming to an end. I was pondering with the idea of staying on for a few days but in the end I was only prolonging returning home. Soooo.. this is where things took a funny turn with an inside joke between myself and my Scottish travel buddy! The group had been booked in for a 6.30pm sail around the Bay just in time for sunset. It was such a windy, wet and wonderful way to spend our last night as a group. The waters were choppy and absolutely freezing to say the least (our boat had a hammock netting as the floor so we could see and feel just how cold the temperatures were). This is what made it so much fun as the antics of everyone standing on it and trying to cross over – not to mention the fact that there was a certain amount of free alcohol involved. We managed to make it over the The Golden Gate Bridge just as the sun began to set and it was something I just stood back and absorbed in. I snapped the odd photo but I wanted to just appreciate the view in front of me.. plus I had lost so many things on that trip I wasn’t about to include my phone to the list! Next stop was a sail around the infamous Alcatraz which was amazing and I was even more excited for it as I was booked in for a tour on The Rock the very next morning – the perfect way to end my trip. I’ve always been obsessed with the prison so this was a real bucket list moment for me… growing up me and my Daddy always watched Escape from Alcatraz and The Rock with my number one, Sean Connery. P.s… the Crookedest Street a.k.a Lombard Street – one of the craziest places within the city. The amount of tourists was very overwhelming for me and that insanely steep hill on the way up nearly kill me – I was drained by the time I reached it. Still pretty regardless and yet another bucket list goal ticked off – no better feeling! OK guys so that is my final instalment from my Summer of travelling around America. I hope you enjoyed it as much as I did. I wish I could have shared so much more with you but naturally I want to keep the majority of my trip private. I did leave a bit of my dignity and my heart in the States but I’m already looking towards my next HUGE adventure that I’m beyond excited for. For now though – I’ll cherish the memories from this one.